McKee's 37 FAST Water Spot Remover 128 oz. Free 32 oz. Spray Bottle! McKee's 37 FAST Water Spot Remover solves an issue that plagues everyone with a car ' water spots! It happens to us all: your vehicle is violently attacked by a sprinkler, leaving behind unsightly water spots that will cause permanent damage if not properly removed. McKee's 37 FAST Water Spot Remover breaks up and dissolves the calcium and mineral deposits that are responsible for creating unsightly water spots. How does it work? GREAT! How does it smell? Like orange soda! FAST Water Spot Remover should be on everyone's detailing shelf. Application is as simple as spraying on and wiping off! Keep it real. McKee's 37 FAST Water Spot Remover is not a miracle product, meaning it won't remove water spots that have been present for months or years. Instead, McKee's 37 FAST Water Spot Remover is designed to bridge the gap between a waterless wash, your first line of defense immediately after water spots form, and a compound, your second line of defense after water spots have been sitting on the finish for a couple days. When a waterless wash is too weak and a compound too aggressive, save time while preserving your ultra-thin clear coat finish by using McKee's 37 FAST Water Spot Remover. The clear coat on your new car is only 3 mils thick, or about as thick as a piece of notebook paper! When water spots are not properly removed in a timely manner, they create unsightly craters that must be mechanically abraded. This takes hours, sometimes days, and costs hundreds of dollars. Having a bottle of McKee's 37 FAST Water Spot Remover in your garage is inexpensive insurance for protecting your vehicle's delicate clear coat finish. 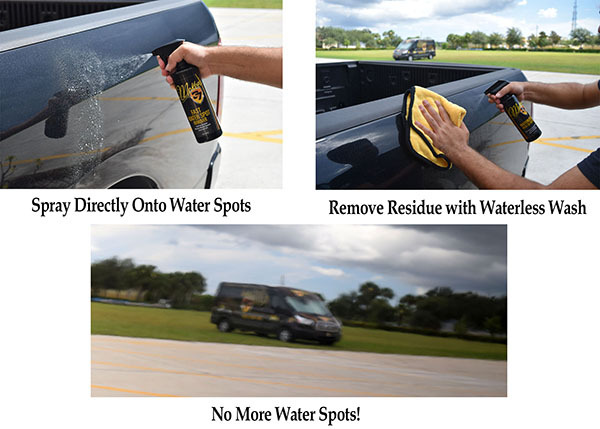 When water spots happen, remove them in a hurry using our FAST Water Spot Remover! Detailing is a hobby for most people (and therapy for others!). Let's be honest: FAST Water Spot Remover doesn't ignite passion like say, our Trademark Carnauba Paste Wax, but I'll tell you what ' you'll be glad to have a bottle handy when water spots attack! FAST Water Spot Remover is certainly not something you want to buy, it's something you need to buy. Be smart. Keep a bottle of FAST Water Spot Remover in your garage when car care emergencies happen. Spray a heavy amount of FAST Water Spot Remover directly onto affected area. Allow to dwell for 1 minute. Wipe affected area clean using a towel dampened with McKee's 37 Waterless Wash On The Go, or wash the vehicle using McKee's 37 Xtreme Foam Formula Auto Shampoo. Apply McKee's 37 FAST Wax to reinforce the existing wax protection.